21 cm 368 p. : col. ill.
Lonely Planet: The world's leading travel guide publisher* Return from your travels with the pictures you've always wanted. 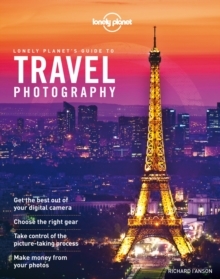 In this revised edition of Lonely Planet's best-selling Travel Photography, internationally renowed travel photographer Richard I'Anson shows you how to avoid common photography mistakes and to develop your compositional and technical skills as a photographer. This jargon-free guide is a comprehensive look at all aspects of travel photography, from the gear needed while on the road to the software and hardware required to store and process your images back at home, to the low-down on assessing, displaying and even earning money with your photographs. * New section on the art of travel photography and how to capture that perfect moment in time * Fully updated for the digital photographer * Covers all camera technologies, from film to phone camera * Make money from your photos "A clear and succinct technical manual to improving your travel photography. "- The Observer (UK) "Bright, inspiring and jargon-free, I'Anson's compact guide takes the mystery out of controlling a camera" - New Zealand Herald Authors: Written and researched by Lonely Planet, Richard I'Anson About Lonely Planet: Started in 1973, Lonely Planet has become the world's leading travel guide publisher with guidebooks to every destination on the planet, as well as an award-winning website, a suite of mobile and digital travel products, and a dedicated traveller community. Lonely Planet's mission is to enable curious travellers to experience the world and to truly get to the heart of the places where they travel. TripAdvisor Travellers' Choice Awards 2012 and 2013 winner in Favorite Travel Guide category 'Lonely Planet guides are, quite simply, like no other.' - New York Times 'Lonely Planet. The title has been replaced. To check if this specific edition is still available please contact Customer Care +44(0)1482 384660 or schools.services@brownsbfs.co.uk, otherwise please click 9781760340742 to take you to the new version.